A heat exchanger is a device used to transfer heat between two or more fluids. Heat exchangers are used in both cooling and heating processes. The fluids may be separated by a solid wall to prevent mixing or they may be in direct contact. They are widely used in space heating, refrigeration, air conditioning, power stations, chemical plants, petrochemical plants, petroleum refineries, natural-gas processing, and sewage treatment. The classic example of a heat exchanger is found in an internal combustion engine in which a circulating fluid known as engine coolant flows through radiator coils and air flows past the coils, which cools the coolant and heats the incoming air. Another example is the heat sink, which is a passive heat exchanger that transfers the heat generated by an electronic or a mechanical device to a fluid medium, often air or a liquid coolant. There are three primary classifications of heat exchangers according to their flow arrangement. 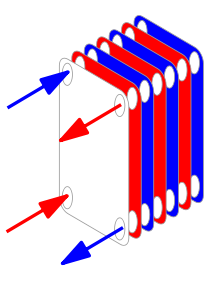 In parallel-flow heat exchangers, the two fluids enter the exchanger at the same end, and travel in parallel to one another to the other side. In counter-flow heat exchangers the fluids enter the exchanger from opposite ends. The counter current design is the most efficient, in that it can transfer the most heat from the heat (transfer) medium per unit mass due to the fact that the average temperature difference along any unit length is higher. See countercurrent exchange. In a cross-flow heat exchanger, the fluids travel roughly perpendicular to one another through the exchanger. The driving temperature across the heat transfer surface varies with position, but an appropriate mean temperature can be defined. In most simple systems this is the "log mean temperature difference" (LMTD). Sometimes direct knowledge of the LMTD is not available and the NTU method is used. Shell and tube heat exchangers consist of a series of tubes which contain fluid that must be either heated or cooled. A second fluid runs over the tubes that are being heated or cooled so that it can either provide the heat or absorb the heat required. A set of tubes is called the tube bundle and can be made up of several types of tubes: plain, longitudinally finned, etc. Shell and tube heat exchangers are typically used for high-pressure applications (with pressures greater than 30 bar and temperatures greater than 260 °C). This is because the shell and tube heat exchangers are robust due to their shape. Fixed tube liquid-cooled heat exchangers especially suitable for marine and harsh applications can be assembled with brass shells, copper tubes, brass baffles, and forged brass integral end hubs. (See: Copper in heat exchangers). Another type of heat exchanger is the plate heat exchanger. These exchangers are composed of many thin, slightly separated plates that have very large surface areas and small fluid flow passages for heat transfer. Advances in gasket and brazing technology have made the plate-type heat exchanger increasingly practical. In HVAC applications, large heat exchangers of this type are called plate-and-frame; when used in open loops, these heat exchangers are normally of the gasket type to allow periodic disassembly, cleaning, and inspection. There are many types of permanently bonded plate heat exchangers, such as dip-brazed, vacuum-brazed, and welded plate varieties, and they are often specified for closed-loop applications such as refrigeration. Plate heat exchangers also differ in the types of plates that are used, and in the configurations of those plates. Some plates may be stamped with "chevron", dimpled, or other patterns, where others may have machined fins and/or grooves. When compared to shell and tube exchangers, the stacked-plate arrangement typically has lower volume and cost. Another difference between the two is that plate exchangers typically serve low to medium pressure fluids, compared to medium and high pressures of shell and tube. A third and important difference is that plate exchangers employ more countercurrent flow rather than cross current flow, which allows lower approach temperature differences, high temperature changes, and increased efficiencies. Large systems with high volume and temperature gas streams, typical in industry, can benefit from steam Rankine cycle (SRC) in a waste heat recovery unit, but these cycles are too expensive for small systems. The recovery of heat from low temperature systems requires different working fluids than steam. An organic Rankine cycle (ORC) waste heat recovery unit can be more efficient at low temperature range using refrigerants that boil at lower temperatures than water. Typical organic refrigerants are ammonia, pentafluoropropane (R-245fa and R-245ca), and toluene. The refrigerant is boiled by the heat source in the evaporator to produce super-heated vapor. This fluid is expanded in the turbine to convert thermal energy to kinetic energy, that is converted to electricity in the electrical generator. This energy transfer process decreases the temperature of the refrigerant that, in turn, condenses. The cycle is closed and completed using a pump to send the fluid back to the evaporator. Microchannel heat exchangers are multi-pass parallel flow heat exchangers consisting of three main elements: manifolds (inlet and outlet), multi-port tubes with the hydraulic diameters smaller than 1mm, and fins. All the elements usually brazed together using controllable atmosphere brazing process. Microchannel heat exchangers are characterized by high heat transfer ratio, low refrigerant charges, compact size, and lower airside pressure drops compared to finned tube heat exchangers. Microchannel heat exchangers are widely used in automotive industry as the car radiators, and as condenser, evaporator, and cooling/heating coils in HVAC industry. One of the widest uses of heat exchangers is for air conditioning of buildings and vehicles. This class of heat exchangers is commonly called air coils, or just coils due to their often-serpentine internal tubing. Liquid-to-air, or air-to-liquid HVAC coils are typically of modified crossflow arrangement. In vehicles, heat coils are often called heater cores. On the liquid side of these heat exchangers, the common fluids are water, a water-glycol solution, steam, or a refrigerant. For heating coils, hot water and steam are the most common, and this heated fluid is supplied by boilers, for example. For cooling coils, chilled water and refrigerant are most common. Chilled water is supplied from a chiller that is potentially located very far away, but refrigerant must come from a nearby condensing unit. When a refrigerant is used, the cooling coil is the evaporator in the vapor-compression refrigeration cycle. HVAC coils that use this direct-expansion of refrigerants are commonly called DX coils. Some DX coils are "microchannel" type. On the air side of HVAC coils a significant difference exists between those used for heating, and those for cooling. Due to psychrometrics, air that is cooled often has moisture condensing out of it, except with extremely dry air flows. Heating some air increases that airflow's capacity to hold water. So heating coils need not consider moisture condensation on their air-side, but cooling coils must be adequately designed and selected to handle their particular latent (moisture) as well as the sensible (cooling) loads. The water that is removed is called condensate. For many climates, water or steam HVAC coils can be exposed to freezing conditions. Because water expands upon freezing, these somewhat expensive and difficult to replace thin-walled heat exchangers can easily be damaged or destroyed by just one freeze. As such, freeze protection of coils is a major concern of HVAC designers, installers, and operators. The introduction of indentations placed within the heat exchange fins controlled condensation, allowing water molecules to remain in the cooled air. This invention allowed for refrigeration without icing of the cooling mechanism. The heat exchangers in direct-combustion furnaces, typical in many residences, are not 'coils'. They are, instead, gas-to-air heat exchangers that are typically made of stamped steel sheet metal. The combustion products pass on one side of these heat exchangers, and air to heat on the other. A cracked heat exchanger is therefore a dangerous situation that requires immediate attention because combustion products may enter living space. Helical-Coil Heat Exchanger sketch, which consists of a shell, core, and tubes (Scott S. Haraburda design). The main advantage of the HCHE, like that for the Spiral heat exchanger (SHE), is its highly efficient use of space, especially when it’s limited and not enough straight pipe can be laid. Under conditions of low flowrates (or laminar flow), such that the typical shell-and-tube exchangers have low heat-transfer coefficients and becoming uneconomical. When there is low pressure in one of the fluids, usually from accumulated pressure drops in other process equipment. When one of the fluids has components in multiple phases (solids, liquids, and gases), which tends to create mechanical problems during operations, such as plugging of small-diameter tubes. Cleaning of helical coils for these multiple-phase fluids can prove to be more difficult than its shell and tube counterpart; however the helical coil unit would require cleaning less often. These have been used in the nuclear industry as a method for exchanging heat in a sodium system for large liquid metal fast breeder reactors since the early 1970s, using an HCHE device invented by Charles E. Boardman and John H. Germer. There are several simple methods for designing HCHE for all types of manufacturing industries, such as using the Ramachandra K. Patil (et al.) method from India and the Scott S. Haraburda method from the United States. However, these are based upon assumptions of estimating inside heat transfer coefficient, predicting flow around the outside of the coil, and upon constant heat flux. Yet, recent experimental data revealed that the empirical correlations are quite in agreement for designing circular and square pattern HCHEs. During studies published in 2015, several researchers found that the boundary conditions of the outer wall of exchangers were essentially constant heat flux conditions in power plant boilers, condensers and evaporators; while convective heat transfer conditions were more appropriate in food, automobile and process industries. Schematic drawing of a spiral heat exchanger. A modification to the perpendicular flow of the typical HCHE involves the replacement of shell with another coiled tube, allowing the two fluids to flow parallel to one another, and which requires the use of different design calculations. These are the Spiral Heat Exchangers (SHE), which may refer to a helical (coiled) tube configuration, more generally, the term refers to a pair of flat surfaces that are coiled to form the two channels in a counter-flow arrangement. Each of the two channels has one long curved path. A pair of fluid ports are connected tangentially to the outer arms of the spiral, and axial ports are common, but optional. The main advantage of the SHE is its highly efficient use of space. This attribute is often leveraged and partially reallocated to gain other improvements in performance, according to well known tradeoffs in heat exchanger design. (A notable tradeoff is capital cost vs operating cost.) A compact SHE may be used to have a smaller footprint and thus lower all-around capital costs, or an oversized SHE may be used to have less pressure drop, less pumping energy, higher thermal efficiency, and lower energy costs. The distance between the sheets in the spiral channels is maintained by using spacer studs that were welded prior to rolling. Once the main spiral pack has been rolled, alternate top and bottom edges are welded and each end closed by a gasketed flat or conical cover bolted to the body. This ensures no mixing of the two fluids occurs. Any leakage is from the periphery cover to the atmosphere, or to a passage that contains the same fluid. Spiral heat exchangers are often used in the heating of fluids that contain solids and thus tend to foul the inside of the heat exchanger. The low pressure drop lets the SHE handle fouling more easily. The SHE uses a “self cleaning” mechanism, whereby fouled surfaces cause a localized increase in fluid velocity, thus increasing the drag (or fluid friction) on the fouled surface, thus helping to dislodge the blockage and keep the heat exchanger clean. "The internal walls that make up the heat transfer surface are often rather thick, which makes the SHE very robust, and able to last a long time in demanding environments." They are also easily cleaned, opening out like an oven where any buildup of foulant can be removed by pressure washing. Self-cleaning water filters are used to keep the system clean and running without the need to shut down or replace cartridges and bags. A comparison between the operations and effects of a cocurrent and a countercurrent flow exchange system is depicted by the upper and lower diagrams respectively. In both it is assumed (and indicated) that red has a higher value (e.g. of temperature) than blue and that the property being transported in the channels therefore flows from red to blue. Note that channels are contiguous if effective exchange is to occur (i.e. there can be no gap between the channels). Counter-current Flow: Fluids flow in opposite directions. These are used for liquid-liquid, condensing and gas cooling applications. Units are usually mounted vertically when condensing vapour and mounted horizontally when handling high concentrations of solids. Spiral Flow/Cross Flow: One fluid is in spiral flow and the other in a cross flow. Spiral flow passages are welded at each side for this type of spiral heat exchanger. This type of flow is suitable for handling low density gas, which passes through the cross flow, avoiding pressure loss. It can be used for liquid-liquid applications if one liquid has a considerably greater flow rate than the other. Distributed Vapour/Spiral flow: This design is that of a condenser, and is usually mounted vertically. It is designed to cater for the sub-cooling of both condensate and non-condensables. The coolant moves in a spiral and leaves via the top. Hot gases that enter leave as condensate via the bottom outlet. The Spiral heat exchanger is good for applications such as pasteurization, digester heating, heat recovery, pre-heating (see: recuperator), and effluent cooling. For sludge treatment, SHEs are generally smaller than other types of heat exchangers. These are used to transfer the heat. Due to the many variables involved, selecting optimal heat exchangers is challenging. Hand calculations are possible, but many iterations are typically needed. As such, heat exchangers are most often selected via computer programs, either by system designers, who are typically engineers, or by equipment vendors. Material selection, such as copper, aluminium, carbon steel, stainless steel, nickel alloys, ceramic, polymer, and titanium. Small-diameter coil technologies are becoming more popular in modern air conditioning and refrigeration systems because they have better rates of heat transfer than conventional sized condenser and evaporator coils with round copper tubes and aluminum or copper fin that have been the standard in the HVAC industry. Small diameter coils can withstand the higher pressures required by the new generation of environmentally friendlier refrigerants. Two small diameter coil technologies are currently available for air conditioning and refrigeration products: copper microgroove and brazed aluminum microchannel. Choosing the right heat exchanger (HX) requires some knowledge of the different heat exchanger types, as well as the environment where the unit must operate. Typically in the manufacturing industry, several differing types of heat exchangers are used for just one process or system to derive the final product. For example, a kettle HX for pre-heating, a double pipe HX for the ‘carrier’ fluid and a plate and frame HX for final cooling. With sufficient knowledge of heat exchanger types and operating requirements, an appropriate selection can be made to optimise the process. Online monitoring of commercial heat exchangers is done by tracking the overall heat transfer coefficient. The overall heat transfer coefficient tends to decline over time due to fouling. Integrity inspection of plate and tubular heat exchanger can be tested in situ by the conductivity or helium gas methods. These methods confirm the integrity of the plates or tubes to prevent any cross contamination and the condition of the gaskets. Mechanical integrity monitoring of heat exchanger tubes may be conducted through Nondestructive methods such as eddy current testing. A heat exchanger in a steam power station contaminated with macrofouling. The rate of heat exchanger fouling is determined by the rate of particle deposition less re-entrainment/suppression. This model was originally proposed in 1959 by Kern and Seaton. Crude Oil Exchanger Fouling. In commercial crude oil refining, crude oil is heated from 21 °C (70 °F) to 343 °C (649 °F) prior to entering the distillation column. A series of shell and tube heat exchangers typically exchange heat between crude oil and other oil streams to heat the crude to 260 °C (500 °F) prior to heating in a furnace. Fouling occurs on the crude side of these exchangers due to asphaltene insolubility. The nature of asphaltene solubility in crude oil was successfully modeled by Wiehe and Kennedy. The precipitation of insoluble asphaltenes in crude preheat trains has been successfully modeled as a first order reaction by Ebert and Panchal who expanded on the work of Kern and Seaton. Cooling Water Fouling. Cooling water systems are susceptible to fouling. Cooling water typically has a high total dissolved solids content and suspended colloidal solids. Localized precipitation of dissolved solids occurs at the heat exchange surface due to wall temperatures higher than bulk fluid temperature. Low fluid velocities (less than 3 ft/s) allow suspended solids to settle on the heat exchange surface. Cooling water is typically on the tube side of a shell and tube exchanger because it's easy to clean. To prevent fouling, designers typically ensure that cooling water velocity is greater than 0.9 m/s and bulk fluid temperature is maintained less than 60 °C (140 °F). Other approaches to control fouling control combine the "blind" application of biocides and anti-scale chemicals with periodic lab testing. Plate and frame heat exchangers can be disassembled and cleaned periodically. Tubular heat exchangers can be cleaned by such methods as acid cleaning, sandblasting, high-pressure water jet, bullet cleaning, or drill rods. In large-scale cooling water systems for heat exchangers, water treatment such as purification, addition of chemicals, and testing, is used to minimize fouling of the heat exchange equipment. Other water treatment is also used in steam systems for power plants, etc. to minimize fouling and corrosion of the heat exchange and other equipment. A variety of companies have started using water borne oscillations technology to prevent biofouling. Without the use of chemicals, this type of technology has helped in providing a low-pressure drop in heat exchangers. The human nasal passages serve as a heat exchanger, with cool air being inhaled and warm air being exhaled. Its effectiveness can be demonstrated by putting the hand in front of the face and exhaling, first through the nose and then through the mouth. Air exhaled through the nose is substantially cooler. This effect can be enhanced with clothing, by, for example, wearing a scarf over the face while breathing in cold weather. In species that have external testes (such as humans), the artery to the testis is surrounded by a mesh of veins called the pampiniform plexus. This cools the blood heading to the testes, while reheating the returning blood. "Countercurrent" heat exchangers occur naturally in the circulation system of fish, whales and other marine mammals. Arteries to the skin carrying warm blood are intertwined with veins from the skin carrying cold blood, causing the warm arterial blood to exchange heat with the cold venous blood. This reduces the overall heat loss in cold waters. Heat exchangers are also present in the tongue of baleen whales as large volumes of water flow through their mouths. Wading birds use a similar system to limit heat losses from their body through their legs into the water. The carotid rete is a counter-current heat exchanging organ in some ungulates. The blood ascending the carotid arteries on its way to the brain, flows via a network of vessels where heat is discharged to the veins of cooler blood descending from the nasal passages. The carotid rete allows Thomson's gazelle to maintain its brain almost 3 °C (5.4 °F) cooler than the rest of the body, and therefore aids in tolerating bursts in metabolic heat production such as associated with outrunning cheetahs (during which the body temperature exceeds the maximum temperature at which the brain could function). Heat exchangers are widely used in industry both for cooling and heating large scale industrial processes. The type and size of heat exchanger used can be tailored to suit a process depending on the type of fluid, its phase, temperature, density, viscosity, pressures, chemical composition and various other thermodynamic properties. In many industrial processes there is waste of energy or a heat stream that is being exhausted, heat exchangers can be used to recover this heat and put it to use by heating a different stream in the process. This practice saves a lot of money in industry, as the heat supplied to other streams from the heat exchangers would otherwise come from an external source that is more expensive and more harmful to the environment. In waste water treatment, heat exchangers play a vital role in maintaining optimal temperatures within anaerobic digesters to promote the growth of microbes that remove pollutants. Common types of heat exchangers used in this application are the double pipe heat exchanger as well as the plate and frame heat exchanger. In commercial aircraft heat exchangers are used to take heat from the engine's oil system to heat cold fuel. This improves fuel efficiency, as well as reduces the possibility of water entrapped in the fuel freezing in components. Estimated at US$42.7 billion in 2012, the global demand of heat exchangers will experience robust growth of about 7.8% annually over the next years. The market value is expected to reach US$57.9 billion by 2016 and to approach US$78.16 billion by 2020. Tubular heat exchangers and plate heat exchangers are still the most widely applied product types. (mass per unit time), where the subscript i applies to pipe 1 or pipe 2.
is known as the Log mean temperature difference, and is a measure of the effectiveness of the heat exchanger in transferring heat energy. ^ Sadik Kakaç; Hongtan Liu (2002). Heat Exchangers: Selection, Rating and Thermal Design (2nd ed.). CRC Press. ISBN 978-0-8493-0902-1. ^ a b Saunders, E. A. (1988). Heat Exchanges: Selection, Design and Construction. New York: Longman Scientific and Technical. ^ Perry, Robert H.; Green, Don W. (1984). Perry's Chemical Engineers' Handbook (6th ed.). McGraw-Hill. ISBN 978-0-07-049479-4. ^ Coulson, J. & Richardson, J. (1983), Chemical Engineering – Design (SI Units), Volume 6, Pergamon Press, Oxford. ^ Hewitt G, Shires G, Bott T (1994), Process Heat Transfer, CRC Press Inc, Florida. ^ Kee Robert J.; et al. (2011). "The design, fabrication, and evaluation of a ceramic counter-flow microchannel heat exchanger". Applied Thermal Engineering. 31 (11): 2004–2012. doi:10.1016/j.applthermaleng.2011.03.009. ^ Northcutt B.; Mudawar I. (2012). "Enhanced design of cross-flow microchannel heat exchanger module for high-performance aircraft gas turbine engines". Journal of Heat Transfer. 134 (6): 061801. doi:10.1115/1.4006037. ^ Moallem E.; Padhmanabhan S.; Cremaschi L.; Fisher D. E. (2012). "Experimental investigation of the surface temperature and water retention effects on the frosting performance of a compact microchannel heat exchanger for heat pump systems". International Journal of Refrigeration. 35 (1): 171–186. doi:10.1016/j.ijrefrig.2011.08.010. ^ Xu, B., Shi, J., Wang, Y., Chen, J., Li, F., & Li, D. (2014). Experimental Study of Fouling Performance of Air Conditioning System with Microchannel Heat Exchanger. ^ a b c d Patil, Ramachandra K.; Shende, B.W. ; Ghosh, Prasanfa K. (13 December 1982). "Designing a helical-coil heat exchanger". Chemical Engineering. 92 (24): 85–88. Retrieved 14 July 2015. ^ a b Haraburda, Scott S. (July 1995). "Three-Phase Flow? Consider Helical-Coil Heat Exchanger". Chemical Engineering. 102 (7): 149–151. Retrieved 14 July 2015. ^ Rennie, Timothy J. (2004). Numerical And Experimental Studies Of A Doublepipe Helical Heat Exchanger (PDF) (Ph.D.). Montreal: McGill University. pp. 3–4. Retrieved 14 July 2015. ^ Korane, Ashok B.; Purandare, P.S. ; Mali, K.V. (June 2012). "Heat Transfer Analysis Of Helical Coil Heat Exchanger With Circular And Square Coiled Pattern" (PDF). International Journal of Engineering & Science Research. 2 (6): 413–423. Retrieved 14 July 2015. ^ Kuvadiya, Manish N.; Deshmukh, Gopal K.; Patel, Rankit A.; Bhoi, Ramesh H. (April 2015). "Parametric Analysis of Tube in Tube Helical Coil Heat Exchanger at Constant Wall Temperature" (PDF). International Journal of Engineering Research & Technology. 1 (10): 279–285. Retrieved 14 July 2015. ^ Rennie, Timothy J.; Raghavan, Vijaya G.S. (September 2005). "Experimental studies of a double-pipe helical heat exchanger". Experimental Thermal and Fluid Science. 29 (8): 919–924. doi:10.1016/j.expthermflusci.2005.02.001. ^ "Spiral Heat Exchanger - China Heat Exchanger Tubing Manufacturer". tubingchina.com. Retrieved 2018-11-26. ^ I. A. Wiehe and R. J. Kennedy, Energy & Fuels, 14, 56 – 63 (2000). ^ Plate Heat Exchanger Cleaning Services AKS Heat Transfer. Retrieved 18 August 2017. ^ Randall, David J.; Warren W. Burggren; Kathleen French; Roger Eckert (2002). Eckert animal physiology: mechanisms and adaptations. Macmillan. p. 587. ISBN 978-0-7167-3863-3. ^ Heyning and Mead; Mead, JG (November 1997). "Thermoregulation in the Mouths of Feeding Gray Whales". Science. 278 (5340): 1138–1140. doi:10.1126/science.278.5340.1138. PMID 9353198. ^ "United States Patent 4498525, Fuel/oil heat exchange system for an engine". United States Patent and Trademark Office. Retrieved 3 February 2009. ^ "Boeing links Heathrow, Atlanta Trent 895 engine rollbacks". FlightGlobal.com. Retrieved 3 February 2009. ^ "Market Report: Global Heat Exchanger Market". Acmite Market Intelligence. October 2013. ^ "MIT web course on Heat Exchangers". [MIT]. G.F.Hewitt, G.L.Shires, T.R.Bott (1994) Process Heat Transfer, CRC Press, Inc, United States Of America.